Creative work by CMBell and our clients has garnered five awards from the 34th Annual Healthcare Advertising Awards competition. Three gold awards were given for an internal communication microsite, an OB direct mail, and a video on reducing the cost of homelessness. One bronze award was given for an e-letter. One silver award was given for a video on innovation in health care. The award-winning work was produced by clients in Los Angeles, Denver and Roseville. In this year’s competition, nearly 4,000 entries were judged by a national panel who reviewed creativity, quality, message effectiveness, consumer appeal, graphic design, and overall impact. Hats off to our creative team and to our clients for earning this recognition! GOLD: AHSCR—Internal communication website communicating the reasons behind the new strategic direction and outlining a vision for the company's future. 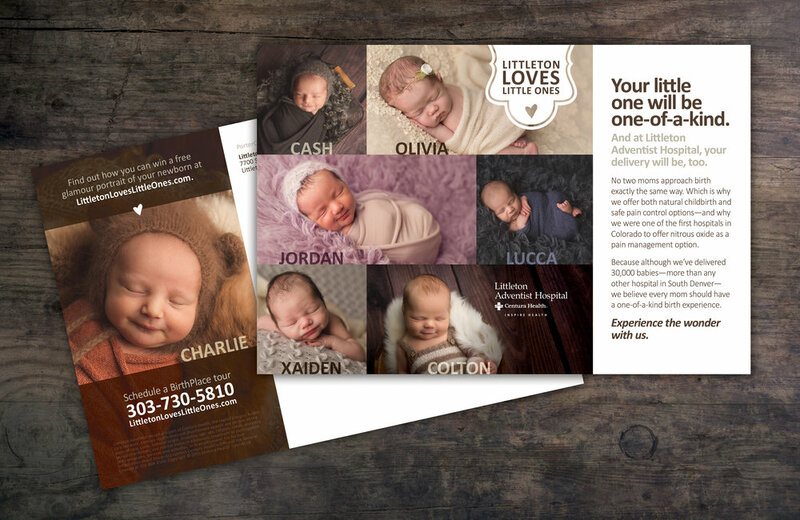 GOLD: Littleton Adventist Hospital—Direct mail piece as part of a larger campaign that significantly increased market share. GOLD: White Memorial Medical Center—A video about their work to reduce the cost of homelessness in Los Angeles. SILVER: Adventist Health—A CEO update on innovation within the company. BRONZE: AHSCR—One of a series of e-letters sent from the CEO to leaders as part of an internal communication campaign that raised understanding of the vision, values and mission of the organization. Can a Sticky Note Increase Your Direct Mail Returns? One author thinks so. According to a study by Randy Garner at Sam Houston State University, the addition of a sticky note significantly improved the chances of reply. While his research centered on survey results, one could see this finding applied to direct mail, too. Four creative projects were selected for awards in the 30th Annual Educational Advertising Awards Competition. The Independent Colleges of Washington 60-year Anniversary Video received a Gold Award, and communication projects for the Oregon Alliance of Independent Colleges & Universities and Walla Walla University received a Silver Award and two Merit Awards. Earlier, these same projects received recognition in the 12th Annual Service Industry Awards Competition. Congratulations to ICW, OAICU and WWU! We’re all overwhelmed with information, so first impressions matter. They determine whether the recipient will go deeper—or walk away. Sometimes you have to break out of the pack to get noticed—before you can make your case. This can be done with humor, arresting graphics, interactive features or by delivering content that’s designed to be kept. Next time you want to create a brochure, think creatively about format. In this piece, individual cards increase engagement and deliver bite-sized messages that aren’t overwhelming—all in a package that uses novelty to pique the reader’s interest. There’s no media buy with this print calendar, and its petite size makes it ideal for a tack board and a year-long reminder of the sponsoring organization. 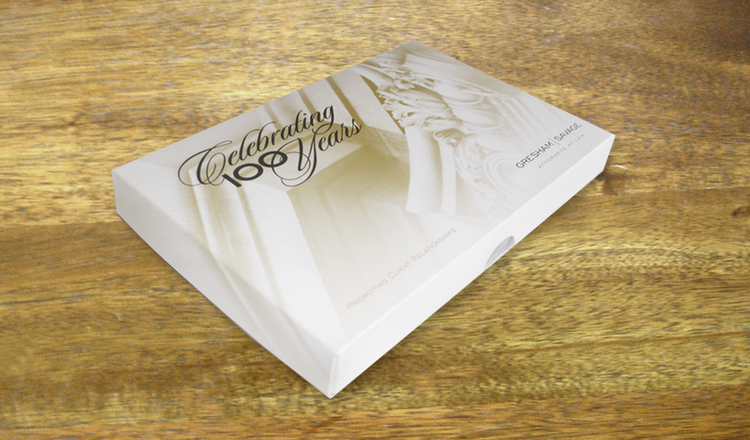 This handsome centennial direct mail piece defied being thrown away, by including a gift pen and beautiful note cards featuring regional icons. In this video designed to recruit new businesses, see how powerful words deliver a message that couldn’t be sent by words alone. We helped a national association promote their website digitally by developing this short video that highlights the site’s benefits. Print isn’t dead, but boring print has always been dead. So how can print pieces be used to catch attention? Interactive. People are more prone to read something that requires their tactile involvement, like sorting through these individual cards. Make it easy for your reader. We used small bite-sized messages on small cards, which aren’t as intimidating as a larger format that telegraphs “reader beware: this will take a while.” The bottom line: we want to browse a piece quickly to determine whether or not it pertains to us. Don’t give the reader a reason to toss it before they start to read. Reduce, reduce, reduce. Readers are skimming more and more, so get to your point before you lose them. Organize content by relevance—and make it easy to keep. Readers can select the info they want to keep, like contact information or hiring tips. And the small card sizes make it easy to slip into a purse or post on a tack board. Originality can take an ordinary message and make it memorable. It’s all in the delivery! If you want to build engagement with prospective clients, think more about creating content they can use—even when they’re not at the point of purchase. Here’s an example. 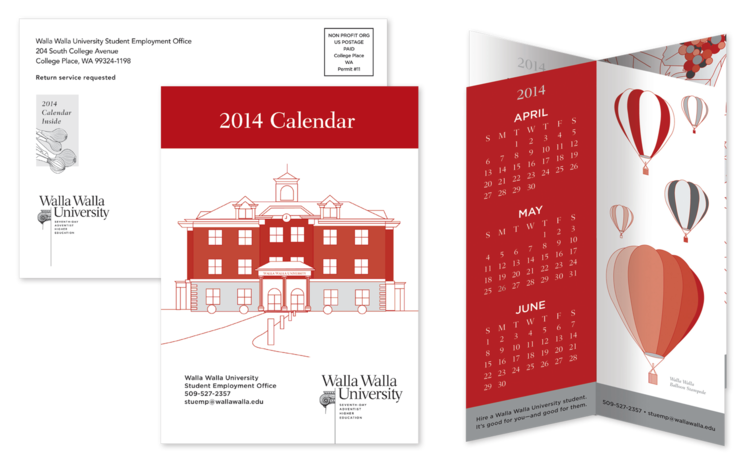 Walla Walla University worked with us to develop useful content on lowering college debt—in both print and video. This is information that interests more than just prospective students. It reaches anyone who is thinking about sending their child to college—thus making it relevant to a much larger target audience. It also helps prospective students see that the university is working to keep costs affordable. The video is short and mobile-friendly—so it’s suitable for all types of digital channels. The companion print piece is used in applications where you don’t want to have to wait for the user to do an online search. You want to hand it to them at a seminar or on campus. Despite that it’s sometimes easy to think that a longer piece will scare off the reader, we made this piece bigger than expected. While we’re proponents of brevity, we wanted to devote a full page to each idea to make it easy to read. The words float on a sea of color or white space—and are paired with simple but attention-getting graphics. This minimalist approach to design provides visual relief for the reader. It invites the reader in, and gives assurance that he or she won’t have to work too hard to digest more words. Make your ideas go down easily. Video—and print pieces that draw you in—are just two tools to help you do that. According to a 2011 study,consumers prefer to receive direct mail and email when hearing from companies who want to do business with them. This is the final piece in a campaign to promote St. Anthony North Hospital's achievements via its 40-year anniversary. This printed piece serves as both a direct mail and a brochure that tells the hospital's story and casts a vision for its future. The campaign theme, "We," celebrates the team's efforts in reaching this milestone, while creating enthusiasm for the hospital's future. It pairs well with the employee video, where we build on a reality-style production to show what "we" means. The campaign included transit, outdoor boards, mall displays, building banners, kinetic typograpy, Web content, videos and print ads. The focus of the messaging was not just about their accomplishments and plans for the future, but was a way to celebrate the achievements of the team, which always infuses energy into an organization. We can't wait to see what they do together in the next 40 years. How are you celebrating the achievements of the people who make your business successful? What company do you know that does this well? This new campaign for North Ridge Medical Practice in Colorado combined direct mail with a mini-animation ad—allowing for targeted advertising and putting them ahead of their competition by having a more Web-friendly, social media-friendly promotion. The presence of the mini-animation ad also delivers information in a format that consumers are showing preference for. Physicians who can deliver strong, targeted messages using contemporary media will likely experience immediate growth in their practice if the message is right and the market has pent-up demand. You can see how they've used this on their website—and how it not only brings the Web page to life but reinforces their key brand messages. Have you seen other physician practices breaking out of the print ad-only approach to promotion? When the growing southern California law firm of Gresham Savage brought on a successful new attorney, they wanted an announcement that would be memorable and impressive. We designed this five-panel piece to introduce him to their clients, using confident colors and sophisticated imagery to make a winning first impression. This direct mail piece won a 2010 Silver Award in the 7th Annual Service Industry Advertising Awards. When St. Anthony North Hospital in Westminster, Colorado, called on us to get the word out quickly about upcoming classes, we created this colorful, engaging direct mail piece to send to their target market. Working within the corporate graphic standards, we developed a distinctive look for their class schedule, which helps drives qualified leads to key services. We worked with the Los Angeles-based Pacific Rim Electrophysiology Research Institute, under the direction of internationally renown Koonlawee Nademanee, MD, to create an invitation for an open house promoting this remarkable facility. Dr. Nademanee has developed an advanced cardiac electrophysiology procedure (EP) that offers new hope and vitality to patients suffering from EP problems. We also developed the logo for the Institute, which has offices on the campus of White Memorial Medical Center in California, as well as in Hawaii and Thailand. Yakima Valley Memorial Hospital is raising money for an innovative, home-like facility for hospice patients who are unable to live out their final days at home. This direct mail piece launched their fund-raising campaign for Cottage in the Meadow and revitalized conversations about living every stage of life fully. The imagery of the piece reflects the idyllic setting of Cottage in the Meadow, inspiring the reader to become a part of something destined to matter deeply to those who need this kind of care. The campaign garnered a Gold Award in the Aster Awards, a Silver Award in the 23rd Annual Healthcare Advertising Awards and a Bronze Leaf Award in the Colorado Healthcare Communicators Gold Leaf Awards. The direct mail piece itself won a Gold Award in the 4th Annual Service Industry Advertising Awards.